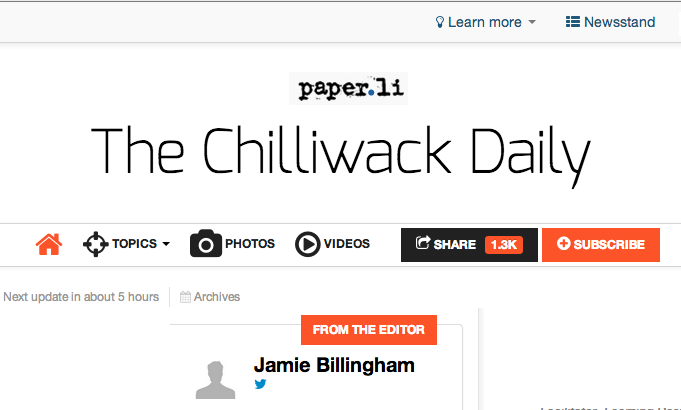 A few days ago I got a request for more information about The Chilliwack Daily, a self publishing, online paper that I created with a free content aggregator/curator called Paper.li. If you’re interested in more background here is a bit of Paper.li history. I’m not sure how many people actually read The Chilliwack Daily or any of the other Paper.li’s I have set up. I originally created the Chilliwack Daily for myself. 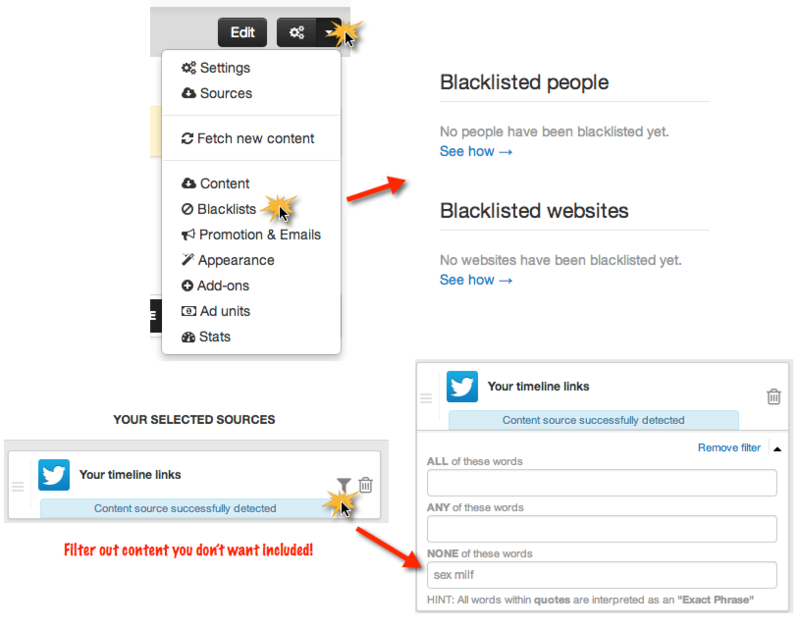 I have it set up to search for and add Tweets about Chilliwack so that I can read it and see the news that I may have missed during a day. It never fails to offer up news and posts I have missed. Paper.li is a great tool for small businesses and not-for-profit associations. Once you set it up, it publishes itself so no one has to put any extra time or effort into it. It a simple way to get your name and interests out there. I have a few Paper.li’s including one set up for Thoughtstream on Stakeholder Engagement that just publishes Tweets, YouTube videos and blog posts that have to do with stakeholder or community engagement. I also have the Jamie Billingham Daily (it’s embedded in the sidebar on this blog) that focuses on leadership, learning and technology. To see how easy it is to set up a Paper.li check out this great how-to video by Ian Cleary from Razor Social. If you decide to set up one or more Paper.li’s think about these things in advance. 1. What will you name your Paper.li? Think of something short and descriptive. Have a couple of options on hand. 2. What sources will you include? 3. Where will you publish to? Twitter, Facebook, Linkedin? All three or just one or two? This is how the posts look. 4. What time of day will you publish? You can publish weekly or daily or even twice daily and you can specify the time of day? When are your people on Twitter? 5. What do you NOT want published in your Paper/li? One of the things the video doesn’t touch on it that you can filter out content that you absolutely don’t want included. 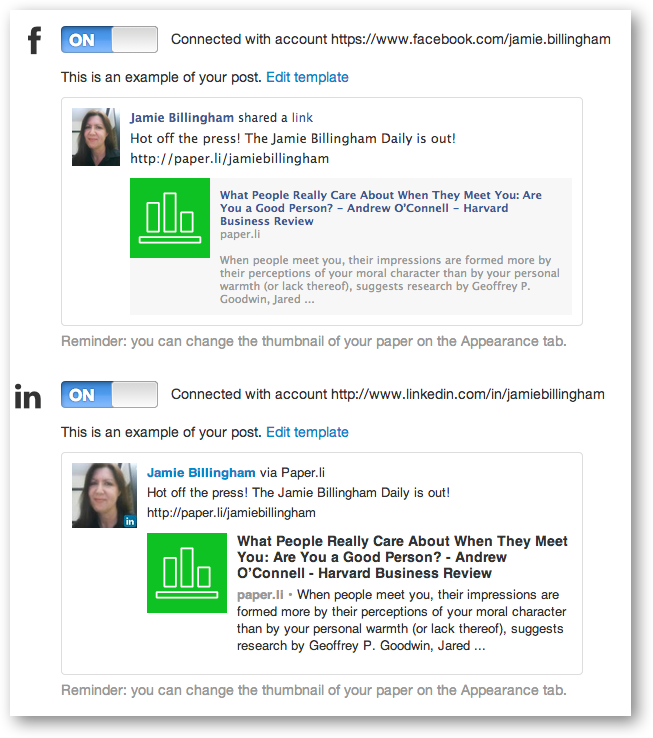 If your goal is to get better known in your geographic community or within your community of interest there are a few really simple things you can do and Paper.li might be a tool that can help you. Before jumping into Paper.li, or other tools for that matter, it’s a good idea to have a full plan in place. Here are two resources that can help with that – Social Media for Non-Profits – First Steps and Creating a Marketing Communication Plan. Want more great ideas about marketing your small business or non-profit association? Get in touch today!